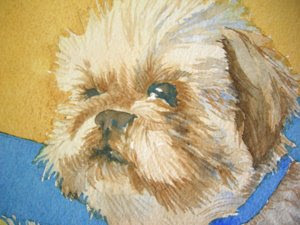 Here you can see how I have applied some of the brushwork for the fur on Scooter's face. Allow the blues to show, and use thoughtful applications of brushwork to develop the fur. Close up it doesn’t look that great, but when you step back a few feet, the eye pulls it together. Caution! Don't overwork the piece!! !